These words capture the incredible nature of our existence. There is a lot to be said about the uniqueness of our humanity and the scope through which we view life. The fact that we hold “celebrations” to call attention to the different joys in our lives is one of the many reasons we are so special. Through our own creativity we have invented expressions of song and dance that depict our innate desire to savor happiness. Our lives are kaleidoscopes of colors, people, emotions, and events. It is through celebration that we express the essence of enjoyment in life, and it is one of the best parts of living. While celebrations are often quiet or personal moments, it is the large, boisterous kinds of celebrations that bring together communities and cultures. In the Bahamas, the annual celebration known as Junkanoo is just this kind of party, and it attracts people from around the world. 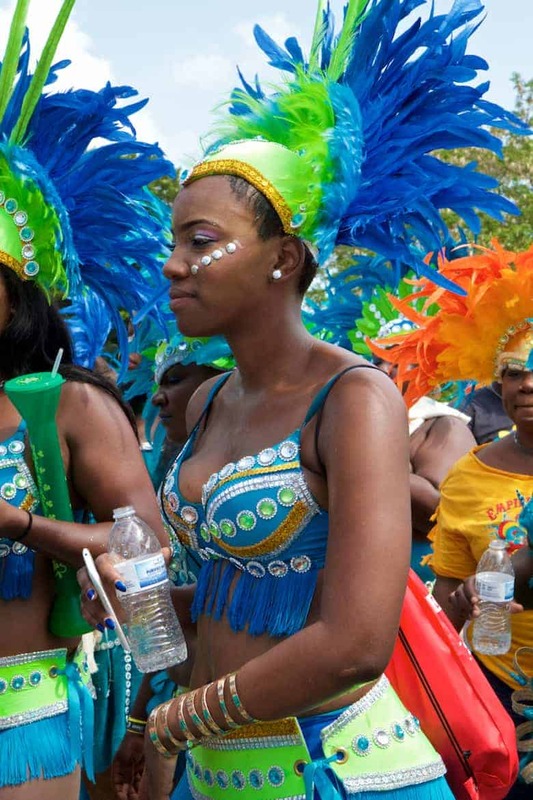 This incredible celebration is a special event that showcases Bahamian culture and traditions. Junkanoo is the essence of happiness and it praises life and heritage with dancing, music, and unmatched merriment. The cultural festival of the Bahamas, Junkanoo usually happens around Christmastime (Boxing Day and New Years Day) and features breathtaking handmade costumes of cardboard, wire and finely cut crepe paper worn by dancing groups and individuals to the unique sounds of pulsating goatskin drums, horns, cowbells, and whistles. Main Street is lined with people for miles as people wait for the sea of sight and sound to arrive. The celebration is an experience you must see while visiting the Bahamas. While there is much debate about the exact origins of the celebration, the Junkanoo Carnival has been traced back to Africa. 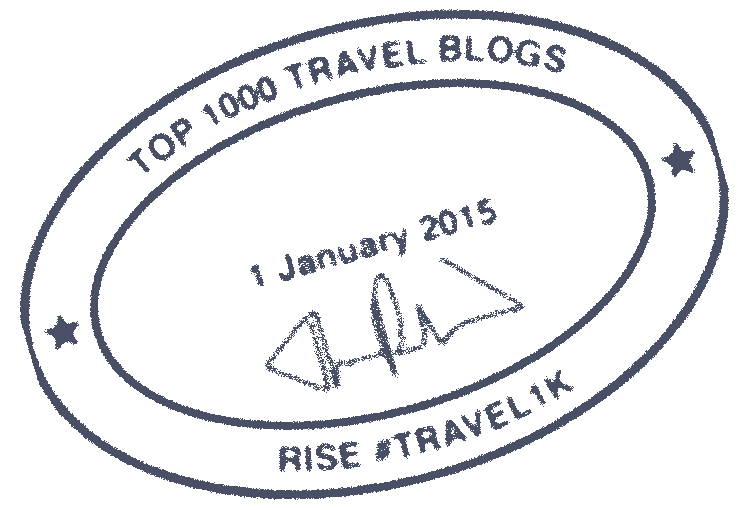 Many accounts claim that the term is an evolution of the name John Canoe. Some stories refer to him as a trader on the West African Coast, some have named him a prince, or even a tribal chief during the time of slavery. 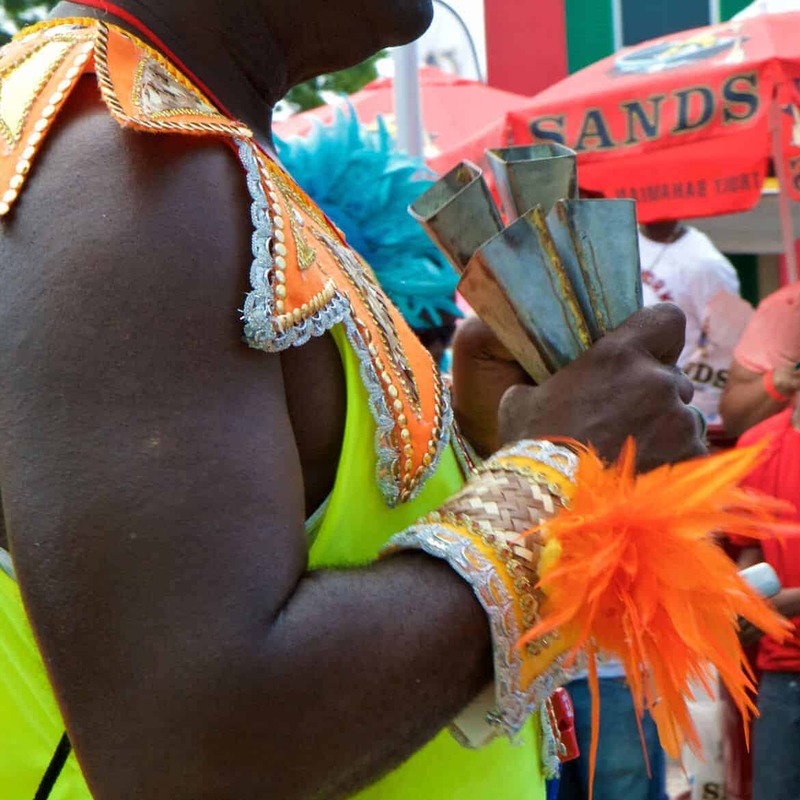 Many different tales give guesses about how this mysterious man played a role in preserving African culture and eventually lead to the naming of the Carnival of Junkanoo. However, other accounts have credited French and even Swedish phrases that evolved to refer to Junkanoo. Regardless of the origin of the name, this lively tradition is thought to have begun somewhere between the 16th and 17th centuries, during the time of slavery, with documented histories in Belize, Jamaica, the Carolinas, and most notoriously, the Bahamas. The celebration started during Christmas time. Under British Law, the slaves within the British Colonies were given three days off starting the day after Christmas. During their rare time off, the people would throw a celebration. This incredible carnival of costumes, music, and joy, kept their heritage alive and celebrated life even through the hardships of slavery. They were determined to nurture their culture and keep it alive even if they had been torn from their homeland. Part of this celebration included creating elaborate costumes. With little material available, costumes were created with supplies on hand such as feathers, plant life, newspaper, straw, and anything that could easily be obtained. With these humble materials, they created immense, elaborate costumes that they would wear during their festivities. They would dance, play music, and go from house to house reveling in the heritage that connected them. Some even believe that the use of newspaper in a time when slaves were not allowed to read was, in itself, a small celebratory act of rebellion. While the costumes play an essential role, it’s undeniable that the music is what makes this extraordinary celebration. With a wide variety of instruments, the cow bell was the most central because it was a common musical item that could be found on a plantation. They would also create makeshift goatskin drums, use whistles, and any available horns to create a melodic symphony that was the soundtrack for the grand carnival that celebrated their lives. It was a representation of life, tradition, love, and joy in the face of a harsh world, a powerful statement of culture and celebration of life. 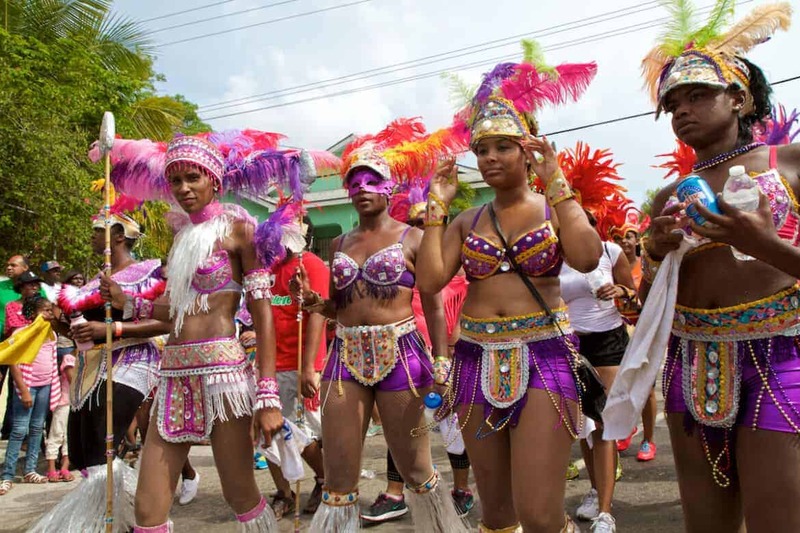 While the tradition has not survived in all of the areas that it once existed, the Bahamas still maintains this wonderful Carnival in honor of the long history of tradition and ancestry. Each year, Nassau holds a parade of costumes, music, and celebration on Bay Street in the heart of the city, and while many other islands hold a Junkanoo celebration, Nassau’s is by far the most extravagant. This year, the addition of a community participation focused Junkanoo Carnival debuted, inviting anyone and everyone to be a part of the festivities. While the traditional 3 day festival at Christmas time is made up of professional artists, the Junkanoo Carnival held May 7-9 allows members of the community to “jump in da line” with their own costumes, music and parade floats. Various events were held throughout the weekend, including a high energy evening concert where Bahamian musicians performed for a chance to win the title of Master of the Bahamian Sound, along with a $20,000 grand prize. Following the Music Masters Concert is a wild afterparty called Midnight Rush. This part of the festival allows anyone to join the celebration without need for dressing up, organizing, or competing. In true, raw celebratory spirit, everyone joins in and dances the night away right in the streets, laughing and smiling with neighbors as well as complete strangers. 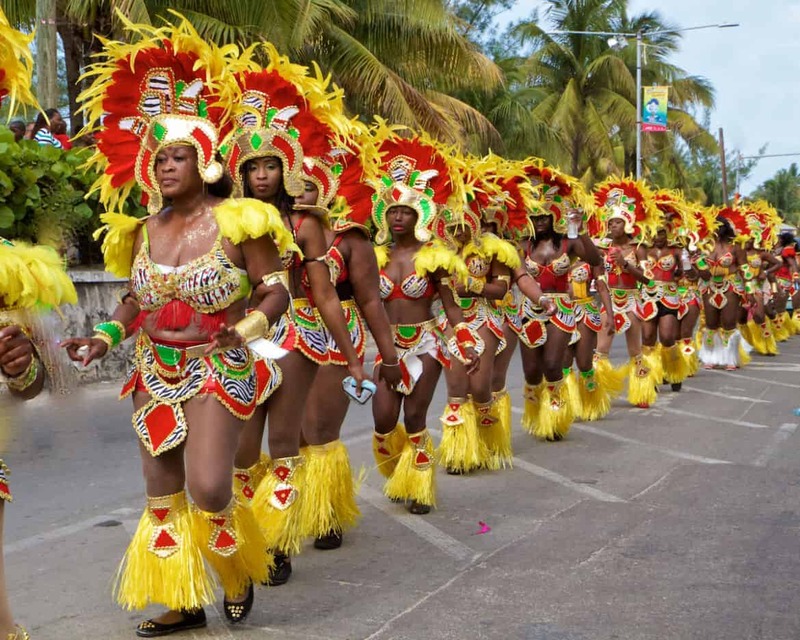 There is no time for sleep this weekend, because the celebrations continue the next day with the Road Fever Parade, a masquerade of the most elaborate and decadent costumes as community members dance through the streets to the sounds of the Bahamas. This isn’t a stand by and watch sort of parade, there is plenty of cheerful interaction as the sea dances by while bystanders dance, sing and follow along with their favorites. We celebrate to cherish the special moments in life, and it is important that we cherish more than just our personal moments. To celebrate culture and heritage with others around the world allows us to create a more global sense of “self”. We may all be from different walks of life, but everyone understands the language of celebration. I’d love to visit here and take part in Junkanoo.